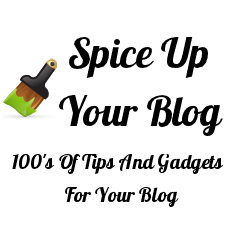 Many of the people that read blogs also write blogs and so love to get some tips on how to Spice up Their Blog.The readers of your blog would appreciate and we would really appreciate if you shared Spice Up Your Blog with them.So if you are going to spread the word we have some information and tools you can use. 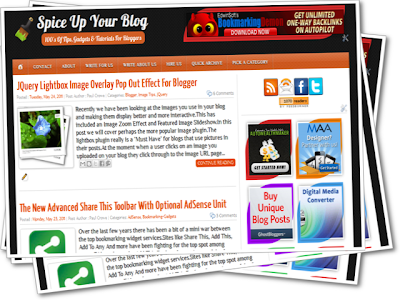 Spice Up Your Blog was launched in July 2009.To date Spice Up Your Blog has almost 400 posts and through Blogger and Disqus over 3,000 comments.In the summer of 2010 BestBloggerTemplates.Net was launched to run alongside SUYB providing Free Blogger Templates. 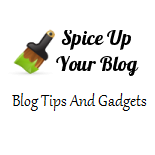 More Information can be found in our About Spice Up Your Blog page. To Use images copy the code below the image or right click on the image and Save to upload to your blog. Thanks for your interest in Spice Up Your Blog and for in spreading the word, it really is appreciated.